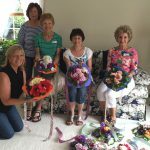 The Rochester Garden Club has many standing committees, in which members work together in smaller groups to accomplish various tasks. These are listed below with a brief description. All members are required to be on at least one committee, but are often members of more than one. Arts & Crafts– has member workshops for fun and educational opportunities. 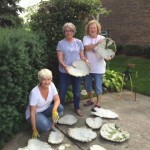 A recent project is making cement leaves. 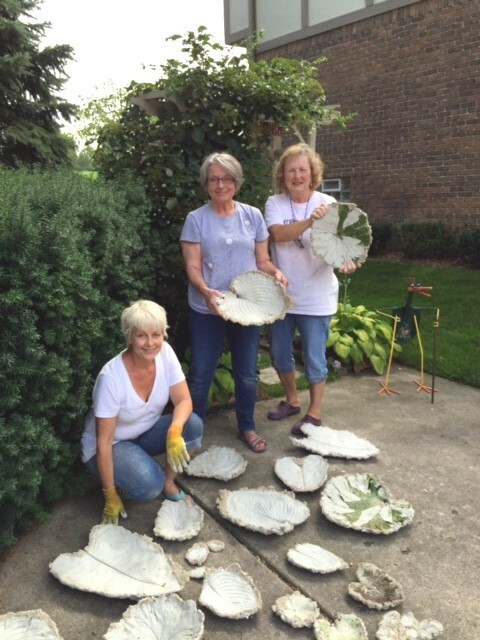 Using leaves from assorted plants and trees, the crafters placed their impressions in cement. This is then followed with painting them to become decorative items for both garden and home decor. 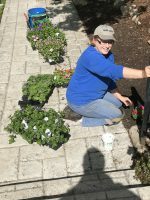 Civic Service – promotes beautification and civic projects within our area; plans and helps plant at public buildings; donates holiday greens to area public buildings in December; and determines an annual Beautification Award winner. The 2017 winner is the Rochester Downtown Cafe. Education, Rural/Urban, and International Cooperation – coordinates our financial donation to the Greater Rochester area Foundation for funding college scholarships to horticulture students; promotes interest in 4-H; and promotes international activities locally and with the state and national organizations. Environmental Stewardship – stimulates wise management of our natural resources. The committee offers members monthly environmental tips and information as well as presenting programs with guest speakers. Flower Arrangements/Show – holds member educational workshops, public seminars, and makes arrangements for civic activities. 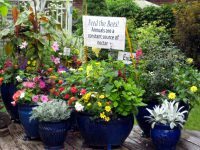 Herbs – studies the culture and use of herbs; meets monthly to feature information about a selected herb; and presents occasional public seminars. 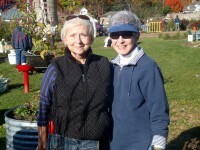 Horticultural Therapy – works with elderly (currently at Sanctuary of Bellbrook) using horticulture as a therapeutic activity. An annual tea party complete with china cups and saucers, refreshments, and flower-festooned hats is a favorite of the residents. The photo shows the members making the hats for the tea. 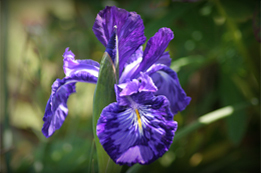 Horticulture – plans horticultural seminars, field trips, and plant exchanges as well as helping to maintain gardens at Van Hoosen Farm Museum. Hospitality – greets members & guests at meetings, sends appropriate greeting cards, and provides email or telephone notification regarding member’s illnesses, death, or family deaths. Membership & June Picnic – accepts and reports membership requests to the Board of Directors; introduces new members at meetings; plans and hosts new members’ orientation; provides a committee member to “mentor” each new member; and plans and carries out the June Picnic. Van Hoosen Farm – participates in the activities of the Museum with emphasis on the continued development and maintenance of the Children’s Garden. The committee will encourage Branch participation in the gardens, Garden Walk, Pumpkin Festival and other museum events and endeavors. Ways and Means – members coordinate and/or act as chairmen of fund raising endeavors. Yearbook – compiles, oversees printing, and distributes the annual Branch Yearbook.